Ivy Strimbold recalls that in the early days the North Bulkley mail came from Kitimat by dogsled to Aldermere (near Telkwa). The railway was not completed until 1914 and the mail came up the coast by steamship. 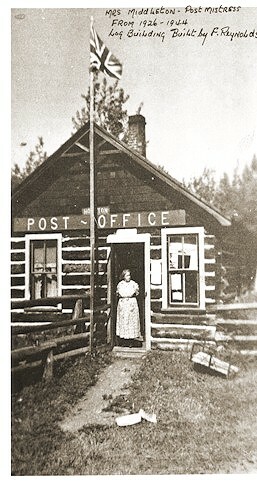 Prior to 1910 Aldermere was the only post office between Quesnel and Moricetown on the old Cariboo Trail. The Houston mail was then brought from Aldermere to Government Ranch on Hungry Hill, a distance of about nine miles west of Houston. In 1909 the Herb Silverthornes arrived in the Pleasant Valley. They built their house on the hill that still bears their name, and shortly after opened the area's first post office and store. They had a locked box in the bushes labelled Silverthorne P.O. Frank Mosher took over the post office in 1914, operating it out of a building on the north side of the tracks in Houston where he ran a store as well. When Mosher died in 1918, the store and the post office was taken over by John Goold. In 1926 when John Goold decided to give up the post office business, he turned it over to Mrs. Annie Middleton, who had arrived from England in 1923. The post office was still housed in the old Mosher home across the tracks, which Father Allard had recently purchased for a Catholic Mission House. Builder Fred Reynolds put up a new log building for Mrs. Middleton on 6th Street, also located across the tracks but further west, almost directly across from the railway station. Mrs. Middleton - Houston postmistress from 1926 - 1944. Log building built by Fred Reynolds. Mrs. Annie Middleton was the mother of Nora (Middleton) Newgard, and grandmother of Dorothy Goldecker, Anne Baggerman, Stan Newgard, Neta (Gerow), and twins Nancy Szydlik and Grace (Gervais). A new postal outlet was opened in 1953 in downtown Houston on 9th St. (approximately where Paradise Sports is located in 1998) and was operated by Nora and Lee Newgard until their retirement in 1965, when the community honoured them for many years of service with a banquet and many gifts of appreciation. Max McKay took over duties of postmaster upon Nora Newgard's retirement. When the Houston mall was opened in 1970, Canada Post was moved to the spot it holds today. Max McKay retired around 1979 and left the area in 1980. He is remembered as an avid fisherman and, along with Helge Byman, as one of the men responsible for establishing Bymac Park on the Morice River. Lutz Budde was postmaster for a time during 1980, and when he left, Lee Ablett, who had been senior assistant, took over the position. She was postmaster until June 1987. Next came Julie Gagne. When she retired as postmaster in December 1993, Canada Post marked Gagne's retirement by calling her "one of the best in the province". Gagne had served the Houston post office from 1988 to 1993. Corinne Printz, who started at the Houston post office in April, 1980, took over the position from Gagne in 1993 and is currently in charge of Houston Postal Operations with Sharon Solotwinski as senior assistant. The Houston Post Office in 1998 has five employees. A computerized postal service was introduced in 1998.